This Shell Has You Covered. It's easy to reserve you storage container today! Click here to book your storage today. We can help with the heavy lifting and refer you to professional loading and packing services. Zippy Shell was founded on the belief that there had to be a better solution for moving and storage. Our innovative equipment design and flexible service options are delivering on our commitment to make moving and storage simple. &bigstar;&bigstar;&bigstar;&bigstar;&bigstar; I used Zippy Shell for my move from Chicago to Los Angeles. Everyone involved was super helpful and great! The 2 men in Los Angeles who helped unload the truck did so in 90 minutes! They were also very careful with our belongings (which included 18 boxes of records - oof!). Nothing was damaged, and everything was as we packed it into the shell. If I ever move again (which hopefully won't be for a long time) I'll definitely use Zippy Shell! &bigstar;&bigstar;&bigstar;&bigstar;&bigstar; I recently did a move from California to Connecticut. I'm so thankful to have found Zippy Shell. They made a really stressful move so much easier. Seriously everyone I talked to from the initial sales rep, to my move coordinator (everyone gets one), my pickup driver, and my drop-off driver... every single one of them were polite, professional, and kind people. Can't recommend them highly enough. &bigstar;&bigstar;&bigstar;&bigstar;&bigstar; I used Zippy Shell from my cross-country move from DC to LA. Customer service was thorough & very available. My stuff arrived unscathed. The timeline was super flexible. Price point was a little high but worth not having any stress. Best part of the company experience was the movers--so friendly & fast. &bigstar;&bigstar;&bigstar;&bigstar;&bigstar; Zippy shell offered excellent customer service throughout the whole move process. They were responsive, on time and great with following up. My move was coordinated seamlessly.I highly recommend Zippy Shell for moving!! Zippy Shell moving and storage solutions combine the benefits of traditional moving services with the security and convenience of containerized solutions. Our innovative equipment design and flexible service options are delivering on our commitment to make moving and storage simple. Whether you are moving across town or across the country, downsizing the family home or just need to clear out the clutter, Zippy Shell is here to help. Core to our service are our custom on-demand portable moving and self storage units. 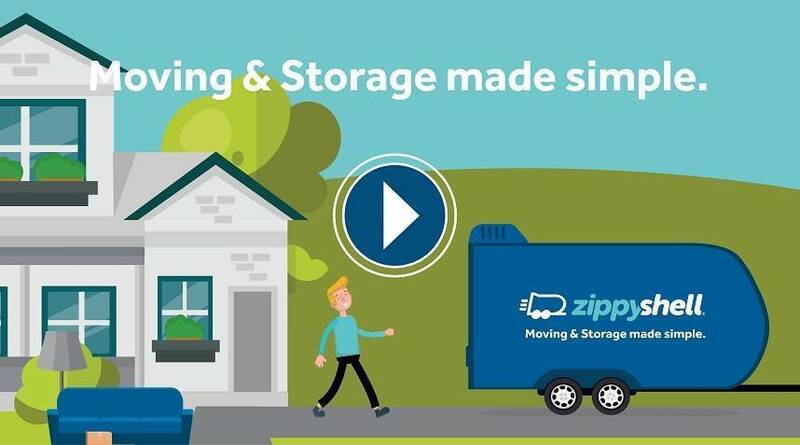 Allowing Zippy Shell to bring moving and storage containers directly to you. To learn more about either our moving or storage services, give us a call today 888-947-7974. We will answer your questions and provide you with a free quote. * Valid for long distance move only.